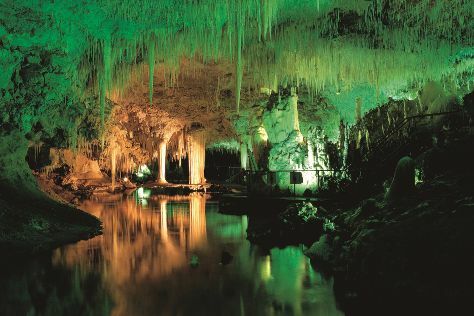 On the 6th (Sun), explore the fascinating underground world of Jewel Cave, explore the fascinating underground world of Lake Cave, then explore the fascinating underground world of Mammoth Cave, and finally identify plant and animal life at Sunflowers Animal Farm. Get ready for a full day of sightseeing on the next day: explore the fascinating underground world of Ngilgi Cave and then see majestic marine mammals with a dolphin and whale watching tour. To see reviews, more things to do, ratings, and other tourist information, go to the Margaret River online route maker . Bengaluru, India to Margaret River is an approximately 19.5-hour combination of flight and bus. You can also do a combination of train, flight, and bus. The time zone difference moving from India Standard Time (IST) to Australian Western Standard Time (AWST) is 2 hours. Finish your sightseeing early on the 7th (Mon) to allow enough time to travel back home.